Top 11 of '11 (iOS). Number 10 - Groove Coaster. by PaulEMoz in "Groove Coaster", "Reisuke Ishida", "Space Invaders Infinity Gene", "Taito"
I'm a bit of a sucker for music/rhythm games. Frequency, Amplitude, Guitar Hero, Rock Band, Rez, Child of Eden (yes, I count those last two)... all have provided me with hours of good times. 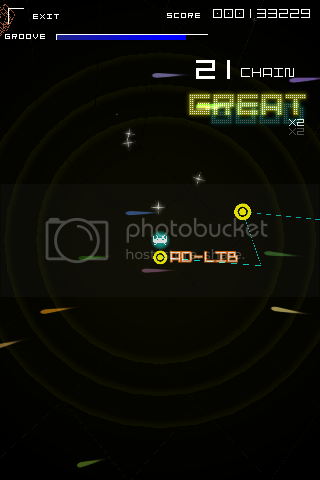 So when I heard of one hitting the iPhone from the creator of the excellent Space Invaders Infinity Gene, I was sold. 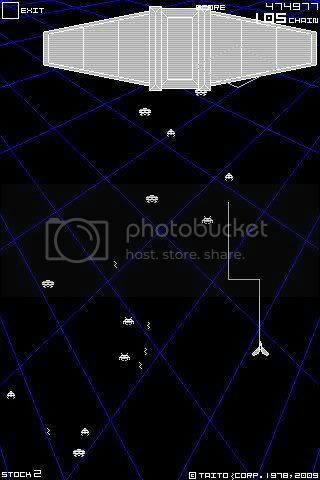 If any of you played Space Invaders Infinity Gene (and I'm sure that plenty of you did), then you'll know that it took the basic idea of Spacies and twisted it into something barely recognisable but brilliant. Groove Coaster didn't have the advantage of a classic framework to build on... so exactly what kind of game would it be? You know what? You're right. 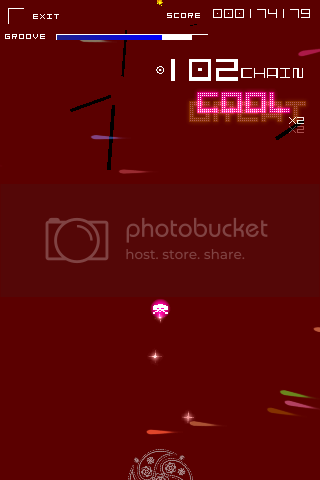 I am cool. It turns out that Groove Coaster is exactly what the name implies. Your avatar rides along a crazy track, looping and swooping in time to the music. At key points on the track, you have to tap the screen in time with the tune. Every time you're successful, you build and add to a chain, with perfect timing giving you a higher score. Miss a beat, and the chain is broken. Bye-bye, high score and S-Ranking! So, Groove Coaster is a very simple game. But there's a lot to it, in the form of unlockables. 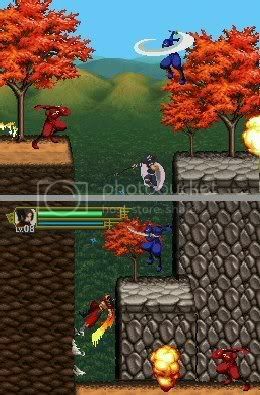 For starters, each level has to be unlocked in turn. That's not exactly a problem or a hardship, by the way... it's just a natural progression. However; you can only play a level on Easy difficulty on your first attempt... there are Normal and Hard difficulty levels to be unlocked for every track. This adds an element of risk/reward to the game, although I'm not sure if I'm entirely comfortable with it. On the other hand, the game might be too easy without these... it's much harder to account for a player's timing issues when all the plyer has to do is tap the screen at the prompt (as opposed to "playing" the notes on plastic instruments). As of the most recent update, the games has around twenty tunes, and with a minimum of three playthroughs of each one purely to complete every level, there's a good amount of game here. Even better, each level is short. That means that nothing outstays its welcome, and it's perfect for bite-sized, time-killer gaming. And the high-score element means you're always likely to want that elusive "one more go" that games developers are dying for you to need. Groove Coaster is a lot more fun than it might have been. It has the odd frustration... occasionally, the shape of the coaster tricks you into thinking there's a beat when there isn't, and your chain is ruined. But even that can be overcome with experience. With high scores to be obtained for every level, avatars and skins to be unlocked and different difficulty levels to be beaten, this is a quality release. As of writing, Groove Coaster is 69p on iPhone/iPod Touch, and it's also 69p on the iPad. I think it's well worth that asking price. Advent Calendar - December 12th. 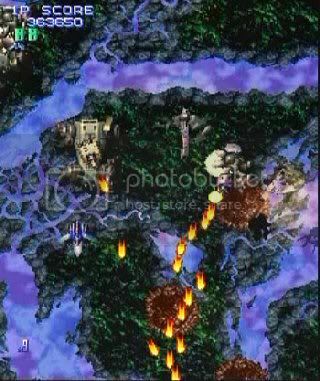 by PaulEMoz in "Taito", "Wizball", "XII Stag", "bullet hell", "shmup"
I love a good shooter, me, even if the only ones I'm half decent at were in the arcades 20-25 years ago. 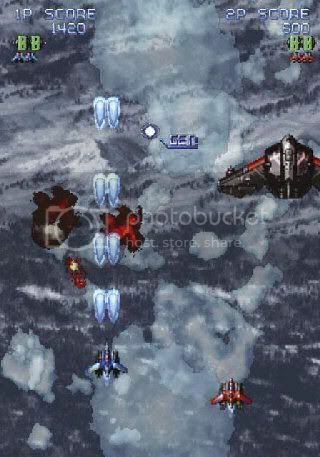 I find modern shmups a lot more difficult... whether that's because I wear glasses or as a result of reflexes diminishing through age, who knows? 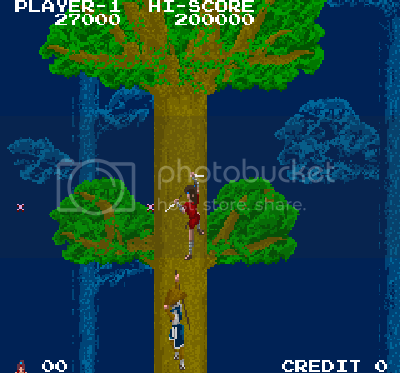 I still enjoy the bullet hell games, though... in the main. Some are just too much for me, even with infinite continues. Cloudy out, innit? Oh... that's just the smoke from wrecked metal ships. 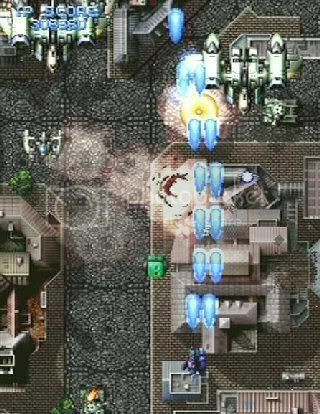 In a world of vertically-scrolling shooters, XII Stag tries to be a little bit different. 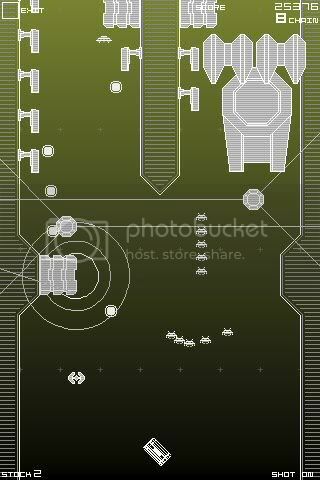 In the main, it's same old, same old... you fly up the screen, enemies swarm onto the screen spewing trillions of bullets, you die. Rinse and repeat until game's end. So in order to distinguish itself from other vertical scrollers, XII Stag introduces a completely different weapons system. As you'd expect for a game like this, your ship is pretty handy at lashing out umpteen forward-firing projectiles per minute. There are no extra weapons to be picked up, although you can power up. There's no bomb either. Instead, you have a barrier which, when activated, opens a bubble around the ship for a short time, and as long as you stay there you can't be destroyed. You have a limited supply of these per ship, so if you choose the right moments to use them you'll maximise their effectiveness. The green, green, grass of death. And here's where the problem lies. The side shooting is only activated by sideways movement. And as the game is designed to throw stuff at you to take advantage of that, you end up doing as much waggling as in the Activision Decathlon. 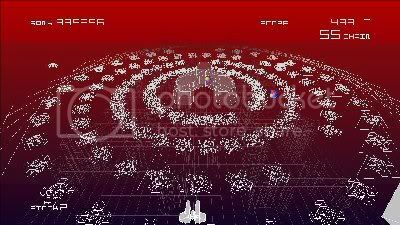 In fact, it brought to mind the days of activating power-ups in Wizball, way back in the Commodore 64 days. 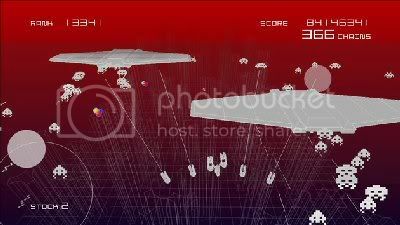 Which is fine if the pace isn't too ramped-up, but XII Stag is a bullet hell shooter, and the last thing you need when you're trying to navigate a screen full of laser death is to be waggling left and right to shoot the stuff that's dispensing it. 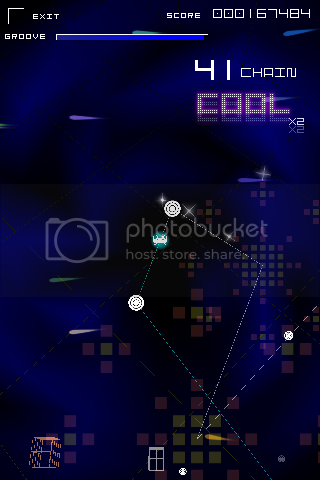 Of course, you can fire forwards as well, and the power-ups add more and more bullets to that directional firepower. But considering the amount of stuff you chuck out, it's surprisingly feeble. There's not much point in getting behind stuff and blasting them when it's like chucking paper darts at a tank. So you have to go into spinning whirligig of doom mode, regardless. What a bind. I don't know of an arcade on the planet that had a XII Stag machine in it, and if there'd been one near me it would have probably only got one ten out of me. That's not because it's a bad game... it's perfectly alright. It's just too complicated and difficult for an aging gamer like me.